Although I have had a twitter account since April 2007, I have still only tweeted just over 100 times! One day into the FOS course and, although I only added half a dozen tweets, I feel that I have improved my understanding of twitter significantly. The focus of yesterday on was digital literacy and identity and I managed to read a good number of the resources in preparation for the evenings TewwtChat #FOSchat which I accessed through TweetDeck mostly. Undertaking activity 1, which was about reflecting on my current practices and what could help students and colleagues, I was left with a feeling of unease that we are, once again, overcomplicating higher education by adding a further ‘wish list’ of what higher education should be doing. In principle, I am convinced and have been for years that to be effective in most work contexts it is essential to proficient with digital technologies and the uses to which they can be put. However, the myriad of frameworks show how we have managed to create a new industry out of something, and my fear is that we exclude the non specialists from this conversation, thereby reducing the likelihood of bringing about meaningful change for our students. Reflecting upon my experience of the approach of using Twitter, I am not sure that I learned a great deal about the subject of digital literacy and identity. However, I did have a good time practicing my digital literacy skills, becoming far more familiar with twitter. Maybe this evening when I can focus less on the process, I will be able to think more about the topic at hand. This entry was posted in LEGO on July 14, 2015 by Stephen Powell. The sessions format was for an initial discussion around resources provided (the homework) and then most of our time spent using LEGO bricks to build models and discuss them as a group. The applications for this technique that we experienced were as a reflective tool (from personal to focussed on an external issue) and also as a tool for creativity and ideas generation. 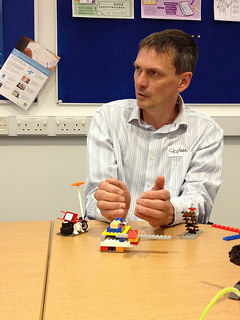 Typically, we, the LEGO players, built models from different perspectives, and then explained ourindividual models to the group (6 in total) at which point the strength of metaphors becomes apparent as an important vehicle for conceptualising and exploring issues. This was sometimes taken a step further by requiring players to then combine their models resulting in a higher level of abstraction about the particular issue or topic at hand. For example, one task required us to: 1. build three models that show, a) how do other people see us professionally, b) how do we see ourselves professionally, C) what would be like to become professionally? We were then asked to place a green block on which of the models was most important to us and then explain ourselves in turn to the group. A discussion then followed with the aim of creating a combined model that represented how we saw the attributes of an effective academic. to be effective the play activities need locating in a wider process that captures ideas and insights and moves on to use or implementation. Depending on the purpose, just being creative in the moment doesn’t feel valuable enough! In my mind, there is a connection between these workshops and the kinds of learning we see in early years in schools around Continuous Provision in that they are based on the principle of structured and purposeful play. I am also reminded of the work of Ultralab where we used the loosely defined concept of delightful learning as a benchmark evaluative term to apply to our projects and activities, and Richard Millwood’s analysis of the work of John Heron on delight is particularly useful as a framework for thinking about approaches such as LEGO play. I enjoyed my time on the course and can see that there are applications in my own work. I will sign up for the next series of workshops that explores this and other approaches to play in learning further, and use these experiences towards a negotiated learning module (FLEX – LEGO play) using the conceptual framework developed by Millwood, based on the work of Heron. This entry was posted in LEGO on July 8, 2015 by Stephen Powell.